Can Yingluck Fix Cambodia Ties? Is China’s Communist Party Doomed? After being sworn into office last week, Hun Sen became the leader of a one-party Cambodian state for the second time in his life. The first time it happened was in 1985, when Hanoi promoted him to prime minister of what was then the socialist People’s Republic of Kampuchea, beginning the rule of one of the world’s longest-serving leaders. It happened again in a carefully orchestrated ceremony in Phnom Penh on September 23, presided over by King Norodom Sihamoni, the nominal head of democratic Cambodia. It wasn’t supposed to be this way. Less than two months ago, the Western world was applauding Cambodia’s July 28 parliamentary elections as a turning point for democracy in the country. The opposition Cambodia National Rescue Party (CNRP) won ashocking 55 out of 123 seats in the National Assembly, despite a litany of failures in the electoral process that skewed the vote heavily in favor of Hun Sen’s Cambodian People’s Party (CPP). E.U. High Commissioner Katherine Ashton could hardly contain her enthusiasm in a letter to opposition leader Sam Rainsy in the days following the ballot. “The preliminary results of the parliamentary elections in Cam­bodia show remarkable gains by your party and I would like to congratulate you on this achievement,” she wrote. The opposition had doubled its representation in parliament, the biggest blow to the CPP in 20 years. However, that wasn’t good enough for the CNRP or its nearly 3 million supporters. Emboldened by their success at the polls, Rainsy and his deputy, Kem Sokha, claimed that if not for manipulation of voter lists and outright electoral fraud, they would have won the election outright. Calls for an investigation into the ballot became the opposition rallying cry. On September 15, the day before Rainsy and Sokha sat down for top-level talks with Hun Sen to breach the political impasse, the CNRP began three days of mass demonstrations in the capital. More than 20,000 people turned out each day to cheer on CNRP leaders as they took their fight to the negotiating table. Nothing came of the talks. The CNRP was willing to accept outright control of the National Assembly in exchange for validating a CPP-led government, a condition that Hun Sen told reporters days later was unacceptable as it would have thwarted the government and made it impossible for the CPP to pass a budget without the CNRP’sapproval. So the prime minister, who was defeated in 1993 elections by the royalist Funcinpec party but never ceded control of the government, pushed ahead with forming a new government without an opposition party. មន្ត្រី​គណបក្ស​ប្រឆាំង​បាន​បញ្ជាក់​នៅ​ថ្ងៃ​ទី​២៩ ខែ​កញ្ញា ថា មន្ត្រី​ក្រុមប្រឹក្សា​ស្រុក​សាមគ្គីមានជ័យ លោក សៅ ហន និង​លោក ឈន ឈឿន កំពុង​តែ​ទន្ទឹង​ចាំ​មើល​ចម្លើយ​ពី​ក្រសួង​មហាផ្ទៃ ចំពោះ​កិច្ច​អន្តរាគមន៍​ថា តើ​ខ្លួន​ត្រូវ​បាន​គេ​អនុញ្ញាត​ឲ្យ​ចូល​បម្រើ​ការងារ​វិញ ឬ​យ៉ាង​ណា? As the opposition boycott drags into its second week, you could forgive one politician for having itchier feet than most. After all, Long Botta has been waiting for 38 years for his second political life to begin. The 70-year-old lawmaker – the Cambodia National Rescue Party’s number two candidate in Battambang province – won his first parliamentary seat this election, almost four decades after he last played a political role in the Kingdom. An appointed cabinet minister during both the Sihanouk and Lon Nol eras, Botta was dramatically evacuated from Phnom Penh by helicopter during the US Navy’s Operation Eagle Pull on April 12, 1975, five days before the Khmer Rouge took the capital. “This is a new life for me. I have dreamed about [this] for so many years, and it happened [so] suddenly,” he says. Returning to the Kingdom from France in 2005, he became an active member of the Sam Rainsy Party in 2008 and was asked to be a candidate for the newly formed CNRP just a few months before the July 28 election. Botta, who was notified that his family would be evacuated just hours before US helicopters left Phnom Penh in 1975, sees the recent election as his final chance to change things in Cambodia. Sporadic demonstrations and political haggling have failed to prompt an independent review of July’s election results, so the opposition Cambodia National Rescue Party is turning to the economy. Along with the threat of a one-day, nationwide strike, CNRP president Sam Rainsy on Wednesday urged the international community, businesses included, to “not engage” with the “illegitimate” government of the Cambodian People’s Party, which claims it bested the CNRP in a vote marred by myriad allegations of fraud. But analysts say Rainsy’s ability to apply pressure through economic means is limited at best. They point out that the CNRP doesn’t have enough sway to influence the international business community and that a daylong strike would not fracture the economy enough to gain the necessary bargaining chips. “All of those institutions have their own rules on how to work with the government, how to apply pressure to the government, how to invest in this country or that country,” political analyst Kem Ley said, referring to international businesses. Historically, a few common factors are needed for boycotts to have real impact: emotion and commitment. “Boycott success usually depends on how strongly people feel about an issue and whether it is easy to participate,” Daniel Diermeier, a professor at Northwestern University’s Kellogg School of Management, said. He added that boycotts are rarely effective in accomplishing their goals but can damage the economy and eventually lead to change when sustained over a long period of time. Local boycotts and divestment from South Africa’s racist, apartheid government played an important role in the downfall of the system, but that was after a number of years. Motivated by the December 1955 arrest of Rosa Parks for refusing to give up her bus seat to a white passenger, residents and protesters in the American city of Montgomery, Alabama, began a 13-month boycott of the public transportation system. CNRP leader Sam Rainsy pays tribute to the victims killed in 1997 grenade attack. PHNOM PENH (The Cambodia Herald) -- The Cambodia National Rescue Party on Monday, held a chanting vigil to commemorate the victims killed in the grenade attack on March 30, 1997. The opposition party leaders, Sam Rainsy and Kem Sokha, along other CNRP lawmakers attended the ceremony held near the former home of the National Assembly. Speaking in the ceremony, CNRP leader Sam Rainsy appealed to the Cambodian government and related authorities to continue their investigation to capture the attackers and bring them to justice. The grenade attack in 1997 killed at least 16 people and injured more than 100 others. Four grenades were thrown into a crowd who had gathered in a park across the street from the former National Assembly protesting the judiciary’s lack of independence and judicial corruption. PHNOM PENH (The Cambodia Herald) -- An opposition party senior official said that the Cambodia National Rescue Party (CNRP) plans hold another mass protest after the conclusion of the Pchum Ben ceremony. Yem Punharith, CNRP’s spokesman, said Friday the CNRP may hold the protest after the Pchum Ben ceremony to demand justice for voters, establishment of an independent committee, and a check and balance system. "The party [CNRP] is currently assessing if the protest is only able to march in some of the bigger provinces, and demand a mass protest for the whole country," he said. "The goals of the protest are to seek the truth and the demand the creation of a committee to investigate and study the irregularities for future reforms, and also seek an effective reform management." Concerning the opposition’s protest warning, Prime Minister Hun Sen recently threatened to release a voice recording from a meeting between the two party leaders, and post it on Facebook. In the cabinet meeting on Wednesday, Hun Sen said the opposition party leader gave up their demands for an election irregularities probe, and recognized that the CPP won 68 seats, while CNRP won 55 seats. Hun Sen, who had just won another five-year term as Prime Minister of Cambodia for the fifth legislature, also raised the issue that the opposition party wanted the National Assembly’s chairman's post, but the CPP rejected. PHNOM PENH (The Cambodia Herald) -- The Club of Cambodian Journalist (CCJ) held a media forum on Monday, concerning "Cambodia’s vision over the next five years under the rule of the new government." The forum held at the Sunway Hotel was attended by Pen Samithy, CCJ president, Denis Schrey, Konrad-Adenauer Foundation representative, Puy Kea, Kyodo news reporter, Pen Bona, Editor-in-Chief at Radio France International, Kay Kimsong, Editor-in-Chief for The Phnom Penh Post Khmer, along with other reporters. The forum, funded by Konrad-Adenauer Foundation, aimed to let reporters learn about information regarding their vision under the rule of the new government over the next five years, especially issues on deep reform and social justice. Speaking at the forum, Denis Schrey urged Cambodian media to make reforms and further equability in both views of the law and broadcast, among the political parties. He said he noticed the level of freedom of expression in social network news, however there are still a lot of reforms needed. Speaking Freely is an Asia Times Online feature that allows guest writers to have their say. Please click here if you are interested in contributing. Articles submitted for this section allow our readers to express their opinions and do not necessarily meet the same editorial standards of Asia Times Online's regular contributors. When it comes to Cambodia, too often commentators focus on what is wrong, not right. While Cambodia still has a long way to go before consolidating a respectable form of democracy, promised changes that have sprung from the contested July 28 general election are potentially significant. On September 25, long-serving premier Hun Sen held the first cabinet meeting of his newly installed government. The meeting was held despite a boycott of the new parliament’s inauguration two days earlier by the opposition Cambodian National Rescue Party (CNRP). Led by opposition stalwart Sam Rainsy, the CNRP has protested the integrity of the election results and refused to participate in government until an independent investigation is launched into widespread allegations of electoral fraud and irregularities. The CNRP has staged a number of street protests to press its claim and is now threatening to launch a nationwide one-day strike. Rainsy has claimed that electoral fraud, ranging from phantom voters to security force intimidation of voters, cost his CNRP a parliamentary majority. The quasi-independent National Election Committee-endorsed result indicated the CNRP won 55 out of parliament's 123 seats. An outright CNRP win would have put a democratic end to Hun Sen's 28-year tenure, the fifth-longest of any serving head of government in the world. To seasoned observers of Cambodian politics, the stand-off appears to cohere to a predictable pattern of post-election horse-trading where the opposition lobbies for powerful posts. Hun Sen told reporters that the CNRP has lobbied for, among others, the position of National Assembly president. Hun Sen has met with Rainsy on at least three occasions, including one five-hour meeting, to break the deadlock, so far to no avail. Activists are skeptical that Cambodian Prime Minister Hun Sen will follow through on a pledge to stop a contentious practice of appropriating rural land for commercial use, an issue that hurt the leader and his party in elections in July. 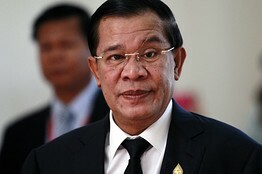 Cambodian Prime Minister Hun Sen, pictured, cited environmental concerns in his pledge to suspend the issuing of new land concessions. Activists are skeptical. In its new five-year political platform issued last week, the Cambodian government pledged to suspend new issuances of “economic land concessions”—a controversial program that was aimed at boosting agricultural exports but blamed by rights groups for a “land-grabbing crisis”—and conduct a review into existing concessions. Activists, however, aren’t convinced, saying that while the moratorium was laudable in theory, concrete action has been elusive so far. Activists say the Cambodian government’s freewheeling issuance of land concessions has denuded large swaths of forests, robbed rural communities of their livelihoods and vitality, and could undercut the country’s fragile development. Already, officials have transferred control of 2.6 million hectares of land to private business from mostly subsistence farmers, according to rights groups, affecting 700,000 people and 73% of the country’s arable land in the past decade. The problem mirrors land conflicts seen elsewhere in Indochina, such as in neighboring Myanmar and Vietnam, where rural residents have also tried to resist what they call unfair government efforts to appropriate land for commercial use. FYI, RFA round table with LP Sam Rainsy and LAP Kem Sokha. A historic report filmed during CPP party leader Hun Sen's takeover of Cambodia. Our camera follows officials of Prince Ranariddh's Funcinpec party as they are secretly smuggled out of the country. After a dash to the airport by car, Funcinpec Head of Security Hong Dar waits nervously as his false papers are checked by airport officials. Like many others denied assistance by foreign embassies in Cambodia's latest crisis, this is his only way out, convinced he'll be tortured and assassinated if he stays. Another fleeing Funcinpec official, his face disguised, tells how Hun Sen's soldiers came to his house and shot his wife. He too is smuggled out the same way. Surrounded by security guards, Hun Sen states he has "no regrets" in using force to oust rival Prince Ranariddh. Press reporters asking unpalatable questions are quickly shoved out of the crowd. Senior Funcinpec member Ung Huot admits Hun Sen approved his appointment as new First Premier. He promises free elections despite suspicions he's merely a puppet of the CPP. Can Kim lost two children when a shell hit her home. Her youngest child, still wounded, strokes her mother's face as she weeps. Human Rights Lawyer Brad Adams says Funcinpec fears are well founded. PHNOM PENH, Sept. 29 (Xinhua) -- Floods has killed at least 28 people, including 16 children, and affected 73,600 families in Cambodia in the last two weeks, a disaster control official said Sunday. Some 7,900 families have been forced to flee their houses for higher grounds as more than 62,000 houses, 385 schools and 245 Buddhist pagodas are inundated, Keo Vy, chief of the Cabinet of the National Committee for Disaster Management (NCDM), said. Ten out of the kingdom's 24 cities and provinces are being hit by the Mekong River and flash floods, he said. "As water still continue to rise, there will be more people affected and evacuated in coming days," he told Xinhua. He said tourism city Siem Reap-Angkor is also being hit by flash floods due to heavy rainfall in the last two days, but floodwaters may not last for long time. Prime Minister Hun Sen on Friday ordered authorities to closely monitor flood situation and prepare to evacuate affected people to safe grounds. He said the impact of low pressure system and tropical storm Wutip has been causing heavy rainfall in the Mekong River basin and in Cambodia. The government’s latest five-year strategy calls for a complete halt to economic land concessions (ELCs) and an inquiry into those still in the pipeline. But the plan has drawn scepticism from conservationists and rights groups, who pointed out that loopholes have been liberally applied after the issuance of similar moratoriums in the past. In the directive, issued on Wednesday as part of the five-year plan governing the next mandate, the government vows to strengthen how ELCs are awarded and regulated in order to “eliminate of all kinds of illegal rampant land grabs, prevent the collection of land without use … [and] resolve land disputes with justice and transparency”. Similarly, it promises to improve crackdowns on forest crimes and put a renewed focus on the protection of forestry resources. But many said yesterday that they doubted that the announcement – though promising on paper – would entail any true reform. “I absolutely don’t believe it, because previously, [Prime MInister Hun Sen] promised to cut his head off if he couldn’t prevent forestry destruction. But, today, he still has his head and continues to offer economic land concessions that affect people throughout the country,” said Kuch Veng, a community activist from Pursat who was sentenced in 2012 to more than three months in prison after staging a series of strikes against powerful developer Pheapimex. In May 2012, Hun Sen issued a complete moratorium on ELCs, saying the human cost had become far too high. But the directive allowed those already approved but not yet begun to move forward – even while refusing to say how many were in the pipeline. The failures of that ban, said Licadho director Naly Pilorge, gave little hope for the newest directive. “It will take more than words to be optimistic on the actual chances of seeing promise becoming reality for thousands of affected families,” she said. Last year, more than 380,000 hectares of land was granted as ELCs or reclassified from state public to private land (a frequent first step toward an ELC grant). The vast majority of it – 71.5 per cent – was pulled from forests and wildlife sanctuaries that are meant to be protected under the law. Conservationist Marcus Hardtke pointed to the willingness of government officials to flout the laws when it came to the granting of concessions as a reason for suspicion over the latest ban. “Most of these concessions are already illegal under Cambodian law.… There is basically a giant timber and land grab going on. If the government wants to be serious at all, there needs to be a complete moratorium on these existing concessions. Short of that, we will not see any improvements,” he said. While cutting down on ELCs, the government strategy, meanwhile, talks about upping the number of social land concessions. With School of Vice's and Khmerisation team's best wishes to all readers around the world on the auspicious occasion of the Khmer Pjum Ben.